We were very honored to be recognized by our community as a "Reader Recommended" School in the 2018 Beacon Media Reader's Choice awards this month in three categories. We were very honored to be recognized by our community as a "Reader Recommended" School in the 2018 Beacon Media Reader's Choice awards this month. 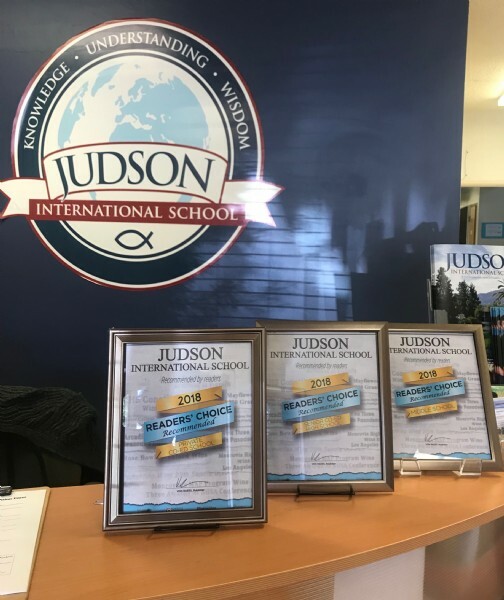 Judson was voted by the community as a 2018 Reader Recommended School in three categories this year: Reader Recommended Private Co-ed School, Reader Recommended Private Co-ed High School , and Reader Recommended Middle School. Our WASC and ACSI accredited K-12 Christian school is known in our community for helping students grow in knowledge, wisdom and understanding to become leaders in God's kingdom and today's world. Our unique International Christian Curriculum emphasizes critical thinking, investigative learning, Christian character development and spiritual growth. These awards are added to previous recognitions such as NIche's "2019 Best School," Pasadena Weekly's "Reader Recommended Best Private School in Pasadena " (2016, 2017), Beacon Media's "Best Middle School (2017) and Beacon Media's "Favorite Private Co-ed High School (2016).